Happy Kitchen Sink Stamps Monday, thanks for stopping by! 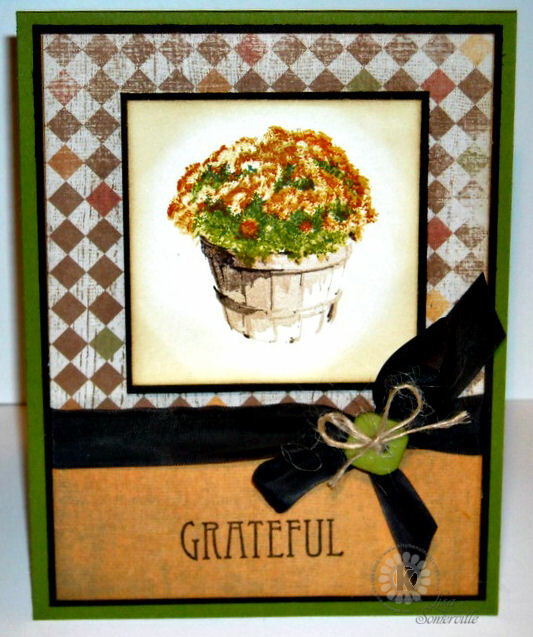 Inspired by this weeks Retro Sketches Challenge and the new Farmhouse Paper (Sugar Hill Collection) I just received from the Ribbon Carousel, I created my card using the Basket of Mums from Kitchen Sink Stamps Multi Step Harvest set. To embellish I added some Walnut Brown Vintage Seam Binding, and an Olive Button that was tied with Natural Jute Twine. The Sentiment is from the Multi Step Harvest set, stamped in Chocolate. Just beautiful Lisa! As always...the KSS stamps are so lifelike. Great colors and paper, can't wait to see the rest of the collection used. Beautiful Fall card, Lisa! Love the basket of mums! Sure wish Fall would get here! Great card, makes it really feel like fall. Love the colors of the mums. Awesome precision with your gorgeous mums, Lisa! You have created a wonderful autumn design with this wonderful set! What a beautiful bushel of flowers! Lovely card! Wonderful card. Great design. Designing looks so tough job to me. I have worked for the Scratch Cards Printing and designing company and there i have realized the it needs so effort and concentration. You done great job. I appreciate this.